Structured lighting laser depth sensing projector, in a self contained laser module for 3D machine vision applications. 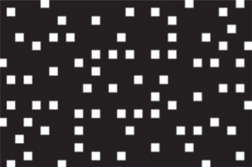 Random Pattern Projector (RPP) is a divergent dot matrix pattern of NxM pixels with a ratio of bright and dark pixels of approximately 15%. Each bright pixel is surrounded by at least 8 dark pixels with no contact between bright pixels. The bright pixels distribution is pseudo-random and the pattern is symmetric with respect to the center. Multiple laser projectors can be tiled to obtain a larger area while maintaining the same random pattern. The Streamline laser can be modulated by an external 0 to 5V extrenal signal through the white wire. The S type modulation comes by default with the Streamline Module. 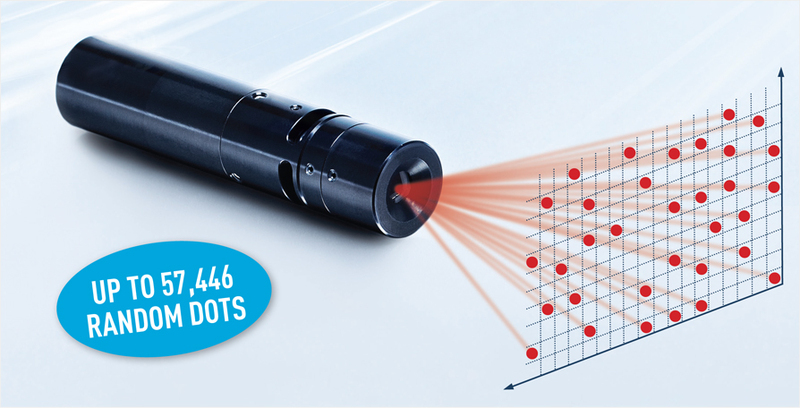 The focusing of the laser is very important parameter as it is directly proportional to the resolution one can attain for machine vision applications. It is important to note the relationship between focus and depth of focus, the tighter the beam size at focus that can be attained the smaller the depth of focus. 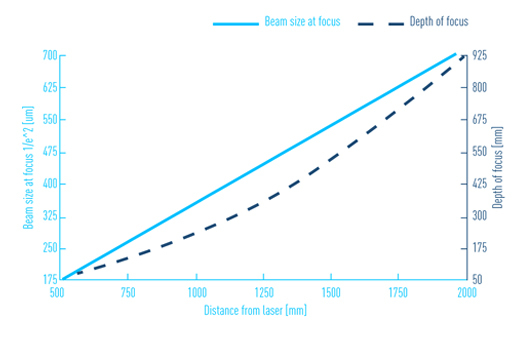 Depth of focus is defined as the distance where the beam size remains within 1.4 times its minimum. At Osela we provide many different focusing options giving you the flexibility to choose the one that best suits your application. The RPP laser is focusable by the user without removing the RPP optic. From the graphs below note the beam size and Depth of Focus (DOF) values and then multiply by the K constants for the laser diode model and focus option of choice. Example: From the graphs at 400 mm working distance, Focus = 140μm, DOF = 36 mm. Then for Laser Model 660 nm 130 mW the beam at focus for OPTION A will be an ellipse having a dimension of 212.8 by 299.6 um (i.e.140 um x 1.52, 140 um x 2.14). Its Depth of focus will be 88.92mm by 177.12 mm (i.e. 36mm x 2.47, 36mm x 4.92) respectively. Also note the beam size and depth of focus is noted for the center beam only. Osela offers two versions of its RPP pattern projector, the Standard (RPP) and Eye Safe (RPPES). 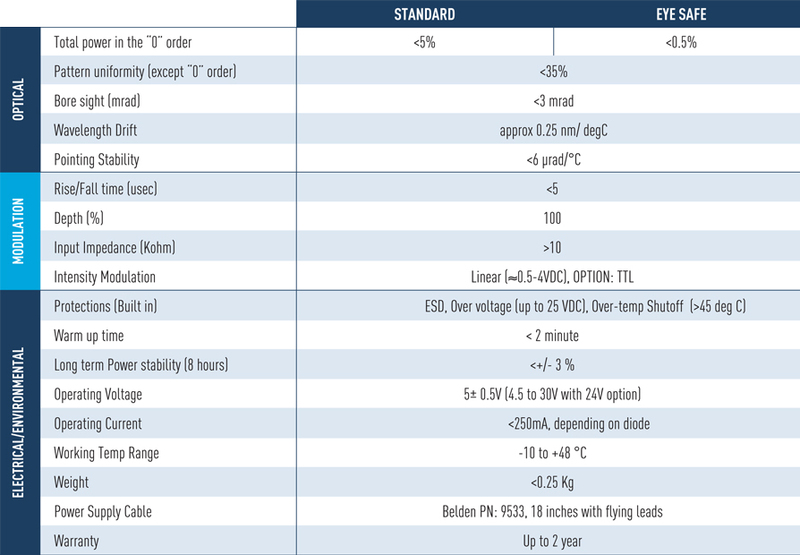 The standard version provides you with the highest overall efficiency but with an intense central dot of < 5% thereby having a IEC60825-1 safety rating of 3B. The RPPES has slightly less overall efficiency but with the added advantage of being IEC 60825-1 Class 1 eye safe.